The RM of St. Clements has 900 km of roads. Taking care of these roads is one the RM’s biggest responsibilities. We aim to keep roads safe and residents mobile. Most of the roads are gravel. Gravel roads require constant maintenance and are unfavourably affected by wet weather conditions. Gravel, grading and dust control make up a large part of our budget. Significant resources are dedicated to maintaining, repairing and upgrading the road system. Hard surface roads require less maintenance but are very costly to construct. This is the reason that these projects are usually done over a two year period. Engineering and base preparation is done in the first year and the actual hard surface is applied in the second year. Road grading is the process of restoring the driving surface of a gravel road to a desired smoothness and shape by removing irregularities such as corrugations and pot holes and redistributing gravel. The grader operator will typically remove these irregularities by cutting the surface of the road or filling them with material moved back and forth across the road with the grader. We always monitor the roads to ensure they are functioning and safe. The RM tracks snowfall. When snow accumulation gets to about 5 cm (2 inches), we start plowing, even if the snow is still falling. Our goal is to have all roads cleared within three days of a snowfall. Note: * The province is responsible for clearing all provincial roads. Community areas, fire stations and transfer stations are cleared first. Typically, the RM starts clearing snow in the north and south ends of the RM, moving towards each other until all the roads are cleared. This is the quickest, most efficient way to get the snow cleared. 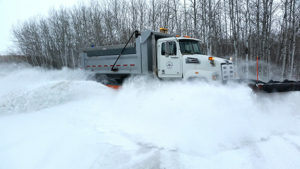 The province is responsible for clearing provincial highways and roads. Our road maintenance procedure is the same every spring, in the order below. All RMs maintaining gravel roads must follow this same routine. Roads are given a quick grading while the frost is coming out of the ground to get them temporarily into shape and ensure they are safe. Roads must be damp or dry to be graded. They can’t be graded when wet as that will makes the roads more muddy. Roads are then graded again to shape, crown and clean up the edges to ensure the road sheds water properly. New gravel is then added. We try to get this done as quickly as we can, but it can often continue into July. The timing of when gravel is applied depends on when road spring restrictions are lifted (usually in late May), the weather and the availability of the gravel contractor. Dust control product is then applied. Timing of this is also dependent on the availability of the dust control contractor. What are spring road restrictions? Spring Road Restrictions protect roads from damage during spring thaw conditions by reducing allowable weights. The RM has restrictions for municipal roads and the province has restrictions for provincial roads. Lean more on spring road restrictions here. Gravel roads are dusty. This is part of the reality of living on a gravel road. When gravel roads dry out they can create dust in the air that settles in adjacent areas. The RM applies a coat of dust control (a liquid form of magnesium chloride) on the road in front of all homes to suppress the airborne dust. The timing of when we apply dust control depends on when spring road restrictions are removed, the weather, the availability of gravel supply contractors, and the availability of dust control contractors. The main reason we apply dust control is to reduce dust in front of homes. We do not apply dust control if there is no home, so there may be long, dusty stretches if there are no homes. If a road has particularly high traffic or heavy truck traffic, we might apply dust control even if there are no homes to ensure safer visibility. We only apply dust control product once per year. Please do not phone and ask for dust control at other times of the year as we will not be applying it. It is not in our budget. When do you start dust control? Dust control can begin when spring road restrictions are lifted and roads have been shaped and graveled, usually by late June. 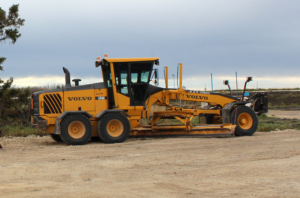 It can take three weeks to apply dust control to all the roads in the RM of St. Clements. The roads are graded before applying dust control to ensure good application and to help it last longer. We try not to grade the roads after dust control is applied as it ruins the dust control. What do you use to control the dust? We use a liquid form of magnesium chloride, a type of salt often extracted from sea water. Magnesium chloride continuously absorbs moisture from the air and literally traps water and locks it in. Magnesium bonds with fine dust particles in the roadbed to stabilize the soil which reduces dust, slows the loss of gravel on road beds and shoulders, and reduces the need for road grading. It reduces erosion and makes gravel surfaces harder and more compact. In addition, an ion exchange happens between the positive and negative charges further binding the road together. Magnesium chloride, a naturally occurring mineral, is a type of salt extracted from sea water. This environmentally preferred compound can be used in sensitive watershed wetland areas and is recognized in Canada as a safe alternative to other dust reduction systems. It is approved by the U.S. Environmental Protection. In large concentrations, it can be corrosive and can damage plants. Do I need to keep kids and pets indoors for a period of time after you spray? No. Magnesium chloride is a non-toxic and environmentally friendly product, and there’s no odor during or after spraying. Not only is magnesium chloride non-toxic, but it actually helps prevent airborne disease. Roads are maintained throughout the summer with regular grading, dust control application and application of gravel. Roads must be damp or dry to be graded. They can’t be graded when wet as that will makes the roads more muddy. In the fall, we can get many requests to grade roads.Our general policy is that after freeze up, we don’t grade roads. When a road is graded, it creates a surface layer of loose gravel that is meant to be packed down by vehicles. After the road is frozen, the gravel won’t get packed into the road and will end up getting plowed into the ditch when the snow falls. Or else it will pack with the snow and be a hard surface for the winter, but come spring when it melts it will become a muddy mess.